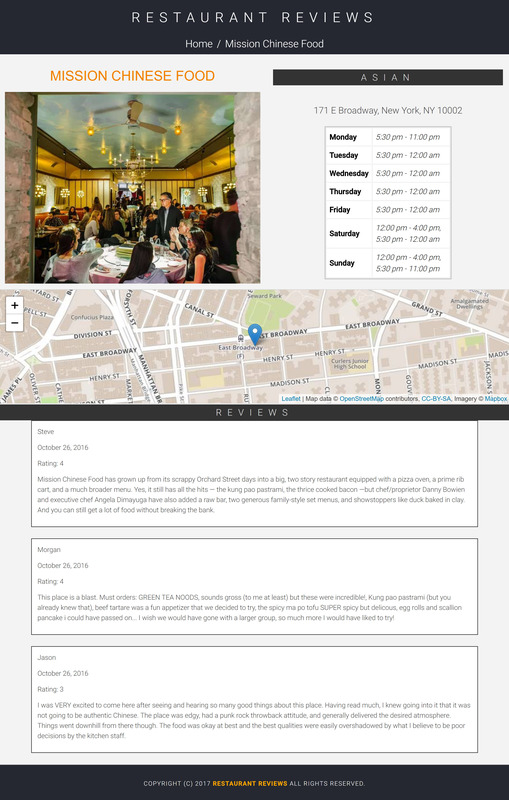 For the Restaurant Reviews projects (Udacity), the task is to incrementally convert a static webpage to a mobile-ready web application. In Stage One, I had to take a static design that lacked accessibility and convert the design to be responsive on different sized displays and accessible for screen reader use. I also began converting this to a Progressive Web Application by caching some assets for offline use. Here is a short video explaining the overview of the project. 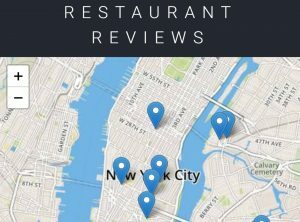 I was provided base code for a restaurant reviews website. The code had a lot of issues. It was barely usable on a desktop browser, much less a mobile device. It also did not include any standard accessibility features, and it did not work offline at all. My job was to update the code to resolve these issues while still maintaining the included functionality. Make the provided site fully responsive. All of the page elements had to be usable and visible in any viewport, including desktop, tablet, and mobile displays. Images could not overlap, and page elements were not allowed to wrap when the viewport is too small to display them side by side. Make the site accessible. Using what I learned about web accessibility, I made sure that altattributes are present and descriptive for images. I added screen-reader-only attributes when appropriate to add useful supplementary text. I also used semantic markup where possible, and aria attributes when semantic markup was not feasible. Cache the static site for offline use. I used the Cache API and a ServiceWorker, to cache the data for the website so that any page (including images) that has been visited was accessible offline. Fork and clone the starter repository. The code in this repository will serve as your baseline to begin development. You will need a MapBox API key. Replace the text <your MAPBOX API KEY HERE>inside of main.jswith your key. MapBox API is free to use, without providing any payment information. Convert the provided site to use a responsive design . Bootstrap and other CSS frameworks should not be used; all responsiveness should be done with CSS. Add a ServiceWorker script to cache requests to all of the site’s assets so that any page that has been visited by a user will be accessible when the user is offline. Only caching needs to be implemented, no other ServiceWorker features. Is the site UI compatible with a range of display sizes? All content is responsive and displays on a range of display sizes. Content should make use of available screen real estate and should display correctly at all screen sizes. An image’s associated title and text renders next to the image in all viewport sizes. Are images responsive? Images in the site are sized appropriate to the viewport and do not crowd or overlap other elements in the browser, regardless of viewport size. Are images accessible? All content-related images include appropriate alternate text that clearly describes the content of the image. Is focus used appropriately to allow easy navigation of the site? Focus is appropriately managed allowing users to noticeably tab through each of the important elements of the page. Modal or interstitial windows appropriately lock focus. Are site elements defined semantically? Elements on the page use the appropriate semantic elements. For those elements in which a semantic element is not available, appropriate ARIA roles are defined. Are pages that have been visited available offline? When available in the browser, the site uses a service worker to cache responses to requests for site assets. Visited pages are rendered when there is no network access. My code for this project is available to download for free from my GitHub account. You can view and download my code repository for the project here.